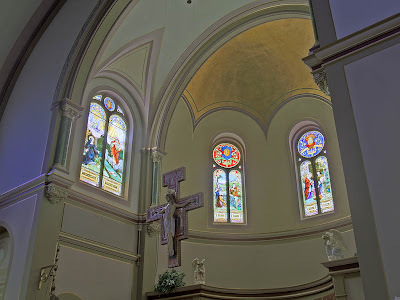 HERE ARE PHOTOS of Saint Charles Borromeo Church, in the City of Saint Charles, Missouri. 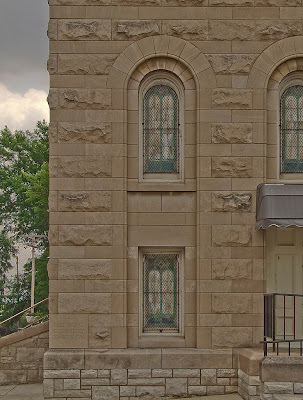 The church is about 23 highway miles northwest of downtown Saint Louis, and is located in Saint Charles County. 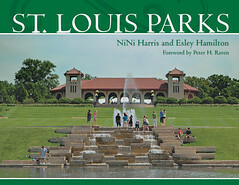 The city and county take their name from this parish. 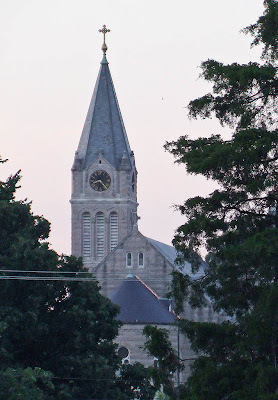 The church as seen from three blocks away. Over 200 years ago, Don Manuel Perez visited the village of Les Petites Cotes,or the "Little Hills." As the Spanish lieutenant governor of Upper Louisiana, Perez signed a petition granting inhabitants of the village permission to build a church. According to area historical records, the meeting took place at the home of French-Canadian fur trapper Louis Blanchette, who founded the village in 1769. The church Perez authorized was San Carlos Borromeo, later anglicized to St. Charles Borromeo. When Perez dedicated the church on November 7, 1791, he named it after the Cardinal of Milan, Charles Borromeo. At the same time, he changed the name of the village to San Carlos, which then became St. Charles in 1803. 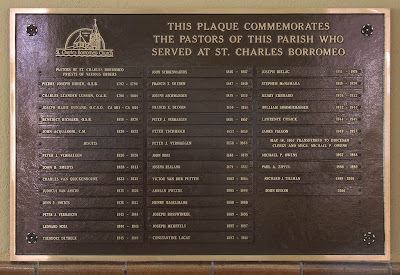 St. Charles Borromeo in St. Charles, Missouri is the third oldest parish in the St. Louis Archdiocese, behind Ste. Genevieve and the Old Cathedral in downtown St. Louis. Several buildings have served the parish since the original church, a typical French log church with a vertical post, was erected at South Main and Jackson Streets. In 1828, a second Borromeo Church was built at North Second and Decatur Streets. 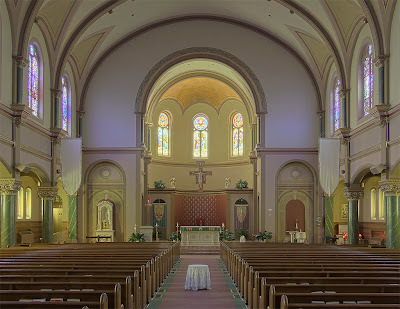 The tremendous growth of the Catholic community necessitated yet a new church, which was built in 1869 at the present site of St. Charles Borromeo. On July 7, 1915, a wind storm destroyed the main body of the brick church. The church was reconstructed, and the cornerstone for the fourth and existing church was laid on April 16, 1916 by Archbishop John Glennon. Click here for more photos of this church. 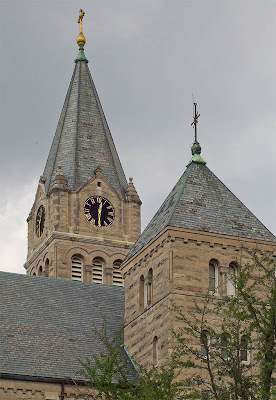 This church is in the Saint Charles historical district, which is well worth visiting. 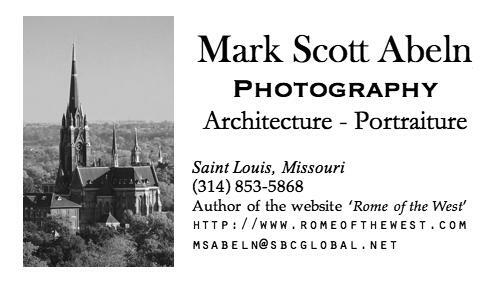 The architecture here is similar to that found in Quebec and New Orleans. 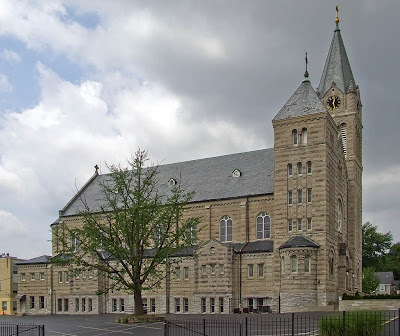 The church is across the street from the Shrine of Saint Rose Philippine Duchesne, which contains the tomb of the Saint. 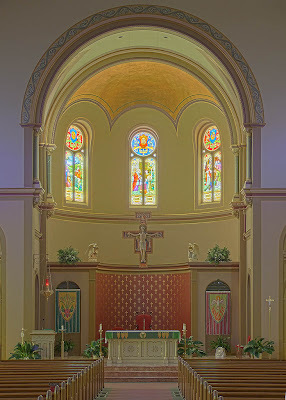 The nave of the church. It has been renovated in recent years. 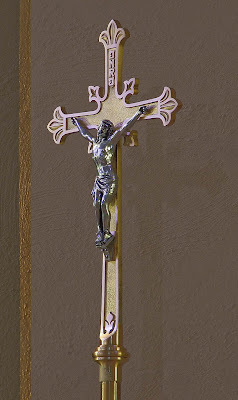 A reproduction of the San Damiano crucifix, which led to the conversion of Saint Francis of Assisi. The original was probably made by a Syrian monk living in Italy. "Francis, don't you see that my house is being destroyed? Go, then, and rebuild it for me." The tabernacle is located to the left of the altar. A view to the side of the nave. Yes, the photo looks odd and plastic. I just starting using different software and haven't quite figured out how to use it well. 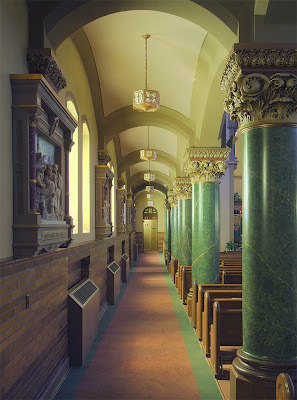 Side aisle, showing Stations of the Cross and columns made of green stone. 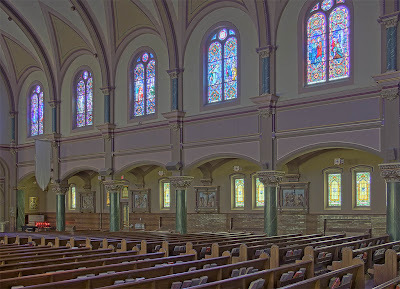 The lower windows in the church are primarily yellow glass, which illuminates the side-aisles with an unusual glow. Iconic windows are located high up on the walls. 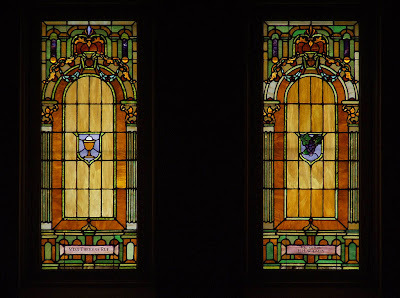 Here is a window of the Resurrection, topped by the analogous symbol of the Phoenix, the mythological bird who dies in flames and then is reborn from its ashes. 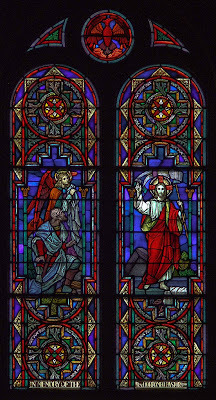 The other window shows the priest-king Melchisedech making an offering of bread and wine, as a prefigurement of Christ. 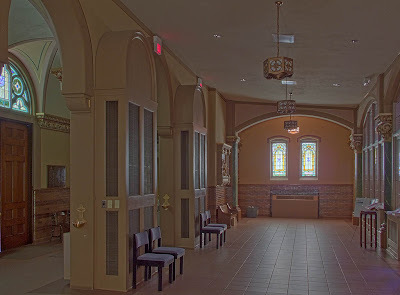 This church has large and elaborate Stations of the Cross. 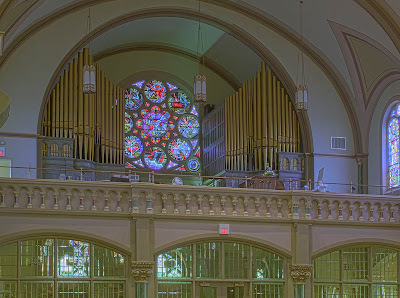 Pipe organ and rose window in choir loft. The back end of the nave was walled off in recent years with glass windows, creating a much larger narthex. Here we see a congregation gathering. 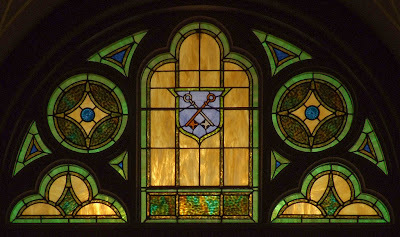 Stained glass window over the main door shows the keys of Peter. The pastors of the parish from 1792 to present. 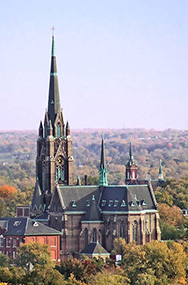 Staffed by various religious orders in the early years, this was run by the Society of Jesus from 1826 to 1957, when it became a diocesan church. Saturday (Vigil): 5:00 p.m. & 6:30 p.m.
Holy Day Vigil: 6:00 p.m.
Holy Day: 7:30 a.m. and 9:00 a.m. 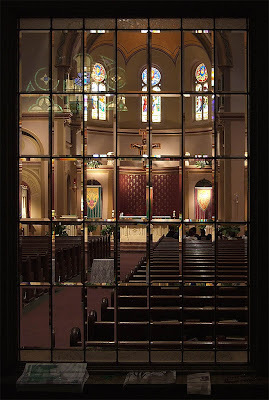 I would like to say that you have a very beautiful church for the worship of our Lord God. 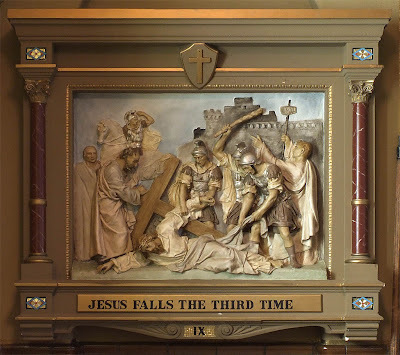 The only thing that I would like to ask is; Why did you people moved the tabernacle of our Lord Jesus Christ and the " high altar" down from behind the low altar ? And put Him over to the side . 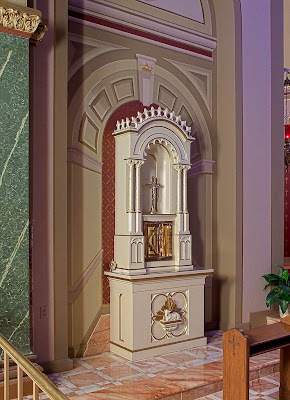 The High Altar holding the Tabernacle of our Lord should be at the center view when people come into your place of worship . Because of Jesus we have the Mass to offer thanksgiving , praise and a sacrifice or our sins to the Almighty God the Father in Heaven . Besides if you read in the Bible you will find that God the Father gave to Moses and St. John a description of Heaven , where the Tabernacle was placed upon the high altar which was behind the low altar . 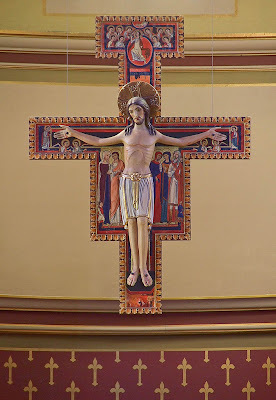 In the description to St. John where the tabernalce and the high altar were, it was replaced with the Throne of Justice where Our Lord Jesus was to rule over His Kingdom , and it would also glorify God even more if the Tabernalce of Our Lord Jesus was placed back behind the low altar . Just some food for thought .